Football Jumpers .com » Blog Archive » Football on a Monday ? Football on a Monday ? Last night at Etihad Stadium , in Melbourne ,43,000 fans watched the dynamic Carlton Blues beat a lacklustre St Kilda Saints team. In a bold marketing initiative ,the AFL has scheduled a Monday night game for the second year in a row. It attracted an almost capacity crowd . Fans were out in their jumpers , jerseys, guernseys. Could this be the start of more Monday night Games ? 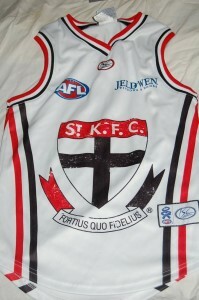 Two new AFL teams , Greater West Sydney and Gold Coast , are scheduled to join the competition in 2011. The AFL has to find new ways to extend the fixture . A match played on a Monday night might be a viable option. 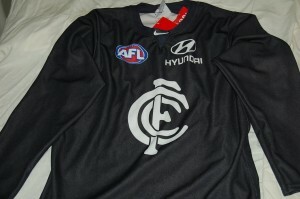 This entry was posted on Tuesday, May 11th, 2010 at 10:28 am	and is filed under AFL, football jumpers. You can follow any responses to this entry through the RSS 2.0 feed. Both comments and pings are currently closed.